When we get outside everyday, I can rest in the fact that all of my children are getting what they need at the same time. So often, I feel like I'm neglecting one child's needs to tend to another's, but the moment their feet hit the earth, I know that all of our needs are being met, even mine. For that reason, I love sharing nature study with my little tribe. It's an area that young children can enjoy too- observing, listening, and just being outside. I was excited to have the opportunity to review Nature Worth Observing: A Year Long Living Science Nature Study Curriculum by the Holistic Homeschooler because I'm always interested in finding ways to simplify this area so that I can enjoy the process of nature study, too. I received this product in exchange for a review, but I always strive to share my honest opinion. Nature study lessons for each season, focusing on specific trees, plants, insects, and animals. Picture painting activities: Charlotte Mason recommended this mental activity to help children really take in the their surroundings. In this curriculum, each season has a picture painting activity. Tree study: Charlotte Mason encouraged us to adopt a tree throughout the year. Each season of Nature Worth Observing includes activities for tree study, including detailed questions to help you direct your child's attention to important features. Book lists for each object studied. 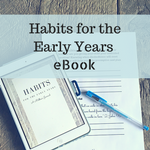 The book lists are leveled by age, so both younger and older children can participate. Printable nature journal pages for each object studied. A poetry packet to deepen the connection to nature. We started using Nature Worth Observing just as the snow gave way to little budding flowers. It is very thorough and detailed, doing a nice job of guiding the mother in what to focus on. (It's easy to feel unsure about what to teach and how to teach it when it comes to nature study!) The direct questions, taken from Anna Comstock's Handbook of Nature Study (affiliate link), were so helpful to me. They call to the attention things that I wouldn't have thought of mentioning on my own. This curriculum follows the same trees throughout the year, which I really appreciate. Several times, when we've started observing a specific tree, we often forget after several weeks, and our plans fall to the wayside. Sometimes I need to be held accountable, and this does exactly that. A poetry packet is also included in this curriculum, offering another way to focus on the lovely. Classic poems describing nature are a wonderful way to integrate several areas in your homeschool. After our first lesson, studying the budding trees in our front yard, Miss H went to make an entry in her nature journal. Without guidance from me, she painted a beautiful branch. This was a far cry from the paintings that formerly occupied her nature journal. I knew what was different this time: this time, she really saw what she was painting. To buy Nature Worth Observing, you can use the code natureworthobserving for 10% off until April 7.